Pappu pulusu aka Pappu charu is a traditional Andhra favorite, nutritionally complete, delicious and easy to cook. 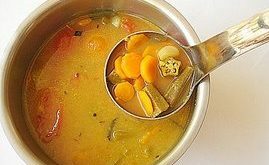 A tamarind based lentil stew cooked with vegetables, Pappu pulusu is redolent with the delicate flavor of curry leaves and seasoned with Indian spices like cumin, mustard, fenugreek and garlic. There are certain foods which have comfort written all over them and Pappu pulusu falls in the comfort food category, which when eaten with rice, makes a soothing combination. It makes a great meat-less main course and is cooked with seasonal vegetables like ladies finger (okra), brinjal (egg plant), shallots, tomatoes, sweet potato, radish, carrot, pumpkin and drumsticks, each of which gives the â€˜pulusuâ€™ a distinctive flavor of its own. In a heavy bottomed vessel, add the mashed dal and water. To this, add the mixed vegetables, shallots, tomatoes, green chillis and turmeric powder. Bring to a boil, reduce heat and let the vegetables get cooked. Once vegetables are cooked, add the tamarind extract, salt and sugar and bring to a boil. Reduce heat and let it simmer for 8-10 mts, till the rawness of the tamarind disappears. Pre-heat oil a pan, add the mustard seeds and let them splutter. Add the cumin seeds, fenugreek, garlic, red chillis and fry for a few seconds till they turn brown. Donâ€™t burn them. Lastly add curry leaves and immediately add to the dal-vegetable mixture. Simmer for a minute or two and turn off heat. Garnish with fresh coriander and keep covered for 10 mts before serving. Ur pappu charu looks mouth watering…Nice pictures Sailu!! Good post Sailaja. Great presentation of pappu pulusu!! Nice post sailu pappu pulusu is my all time fav,I make this every night for dinner. Very nice recipe, Sailu. I love your ladle. Pictures are great as usual. Ah, that’s really bad…:(:(. Wish I could send it over..
Hi- Great site and awesome stuff for an expat andhrite in Japan!. I love the Pappu-Pulusu – my mom makes – which is very similar except that she adds onions too. What’s your take on that?. I totally agree that it’s best eaten a day or later after it’s made. I am on my way.. Vaishali. hey sailu! that’s a lovely recipe, my daughter is sure to slurp it all up! thanks! What to say…yet another favourite andhra food…brilliant snaps.. I dont know, whether it is a prob at my end….I often find it difficult to open your site….tis after a few error messages that I get access and if I click the snaps once again it puts me off…as error….It doesnt happen with any other site…Has it anything specific to do with the browser that I use? The site is experiencing a few server issues and is in the process of getting fixed. I appreciate your patience. Oh!….Sailu how should I thank u, I am new to cooking. While searching in google I found ur pulihora recipe which I followed and it came as per my taste. From then onwards for any recipe I search in google “….by sailu”. I didnt know how to prepare pappu pulusu and I tried ur recipe and it came out really yummy. My husband didnt even leave it till it was completed in just 2 days. He is asking about pappu pulusu only. If there is enough time I can go on thanking you. Any how thanks a lot Sailu. Hi, your recipe looks really good and I would like to make it. What exactly are drumsticks? This was the pulusu I always wanted to cook but never got it right. thank you sooooooooooooooo much. Tried it and turned out really yummy…Thanks for posting this recipe..